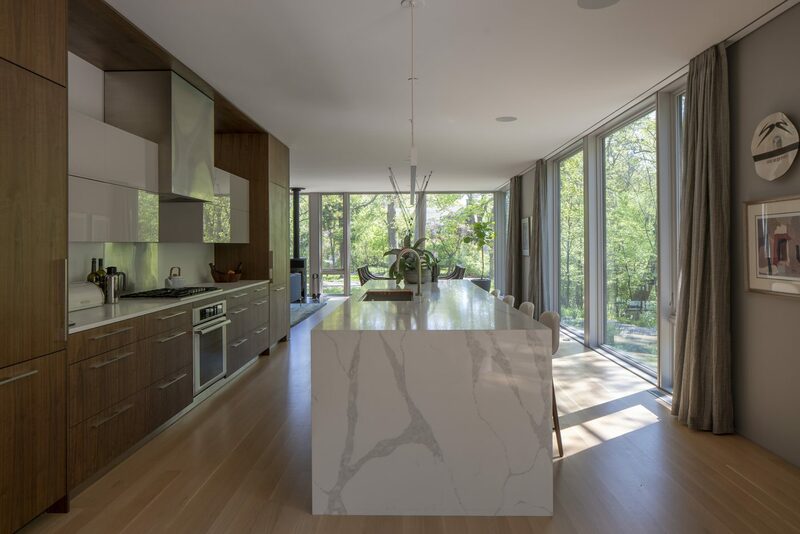 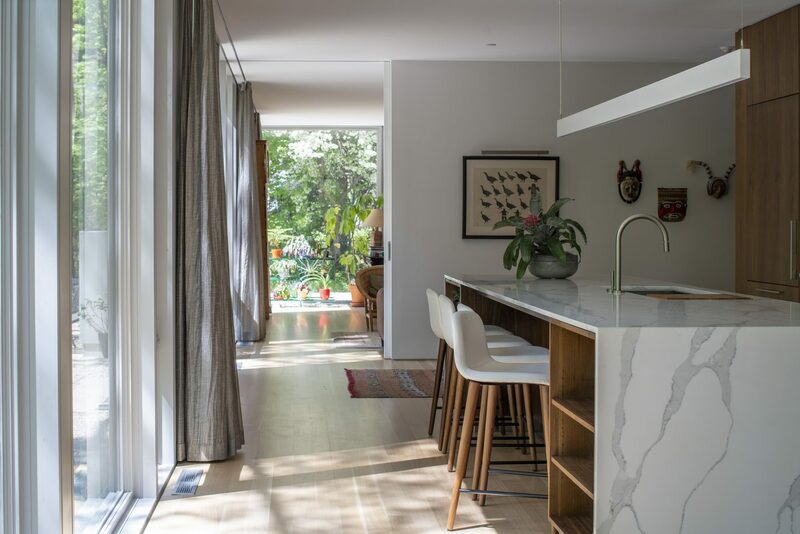 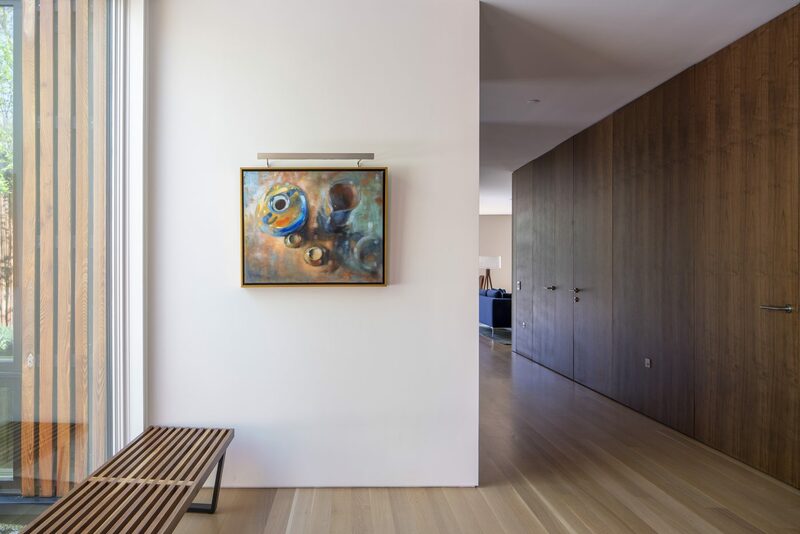 The clients, both avid cyclists and nature enthusiasts, sought to create a modestly scaled single-floor house that supports their active lifestyle and personal interests while quietly engaging with the ravined site. 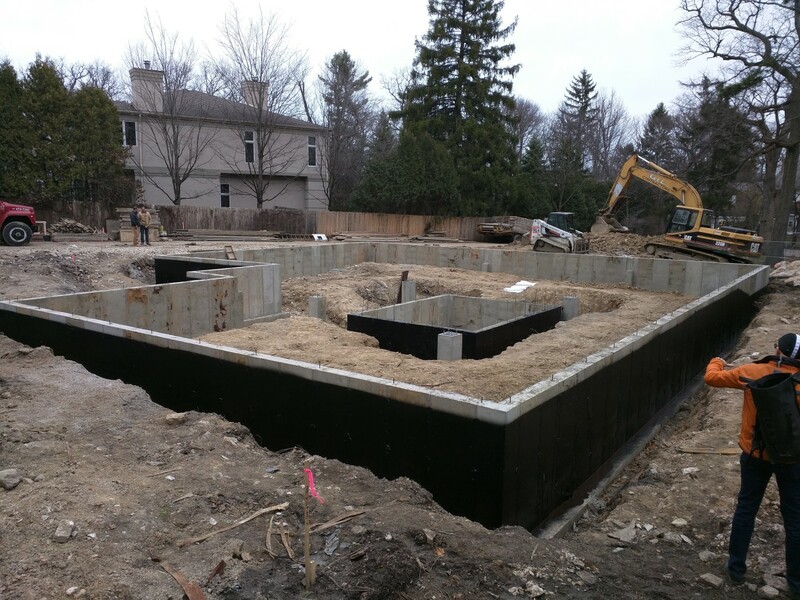 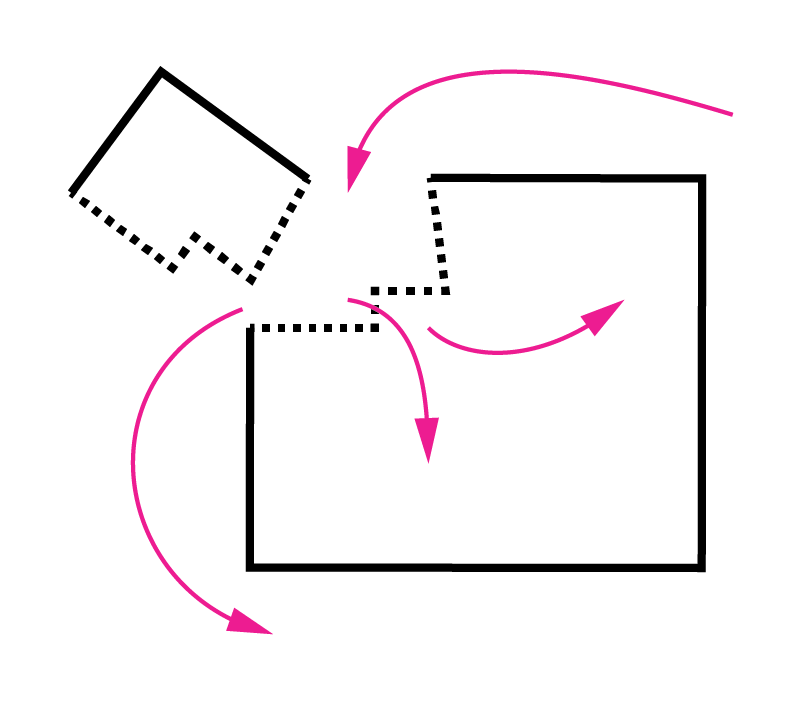 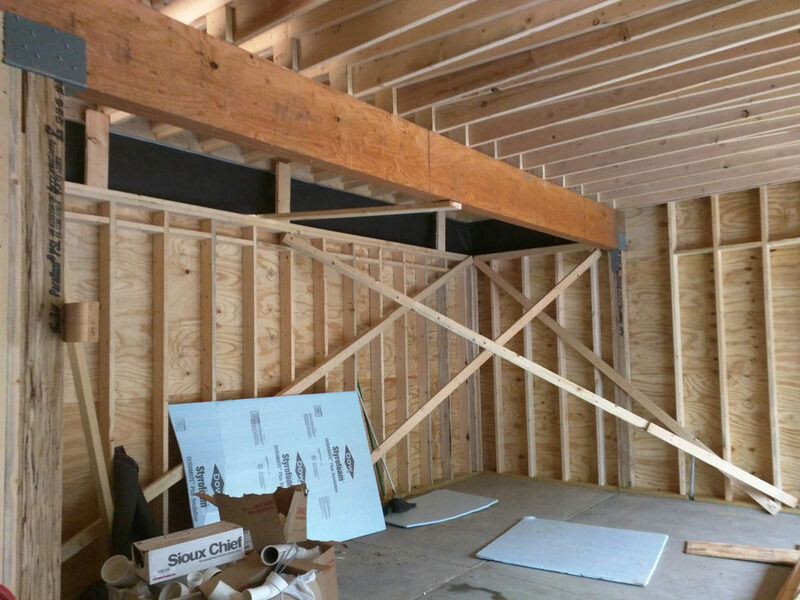 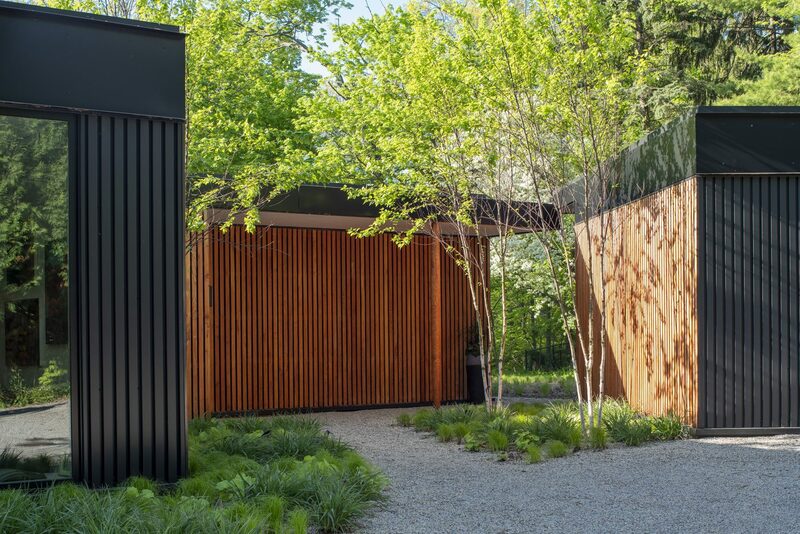 The house is conceptualized as a single, dark, rectangular volume, from which a corner (a garage) is broken off to create an entry courtyard. 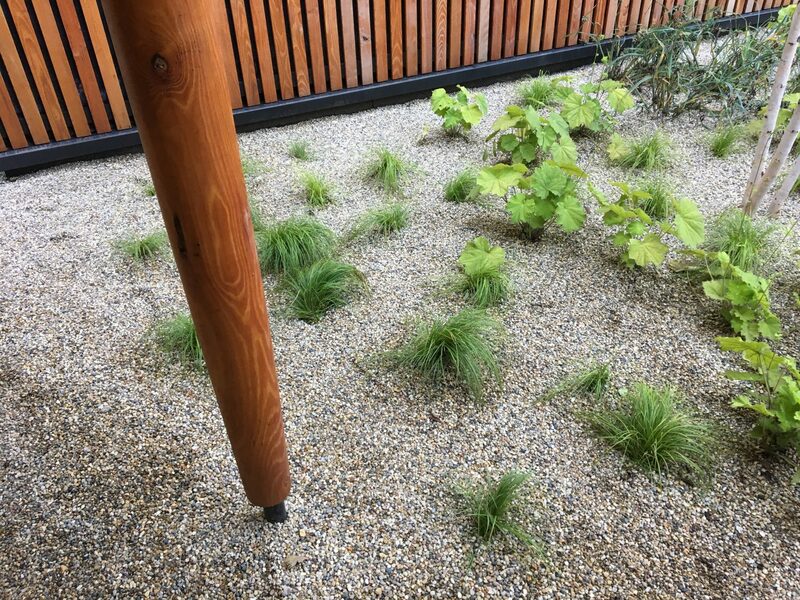 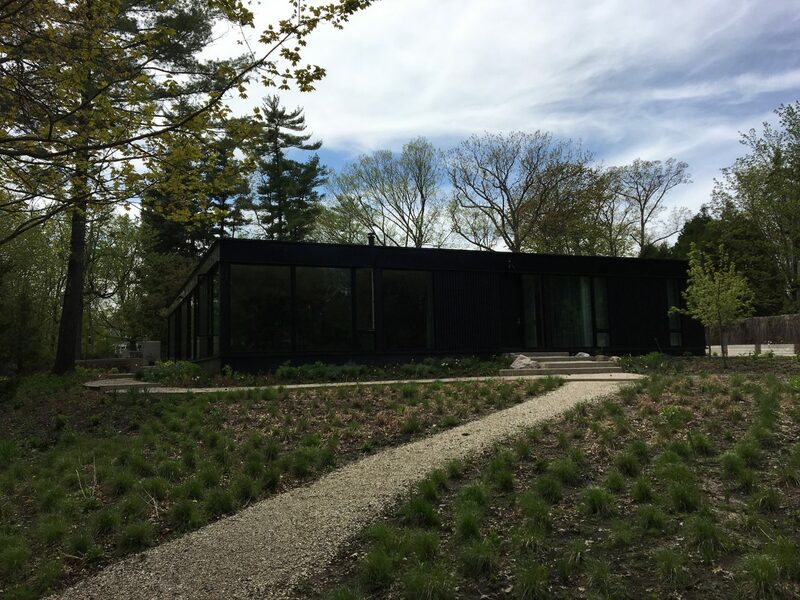 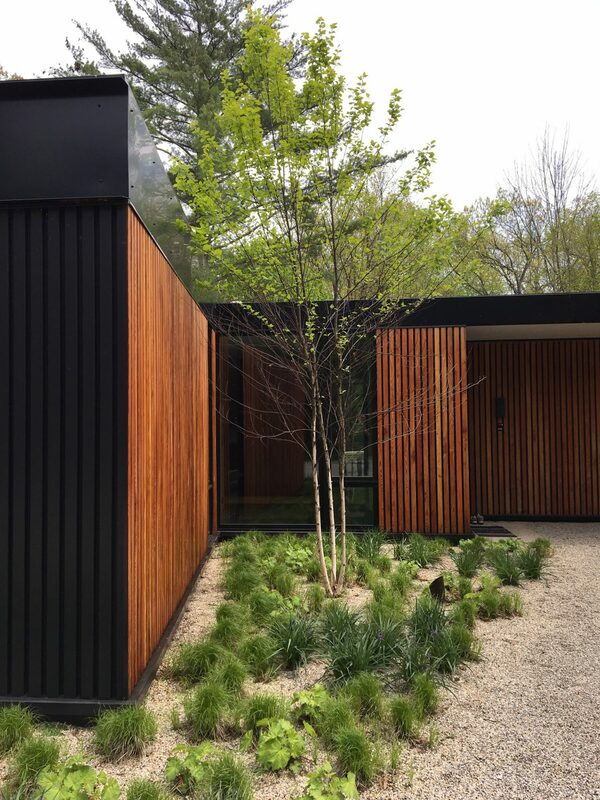 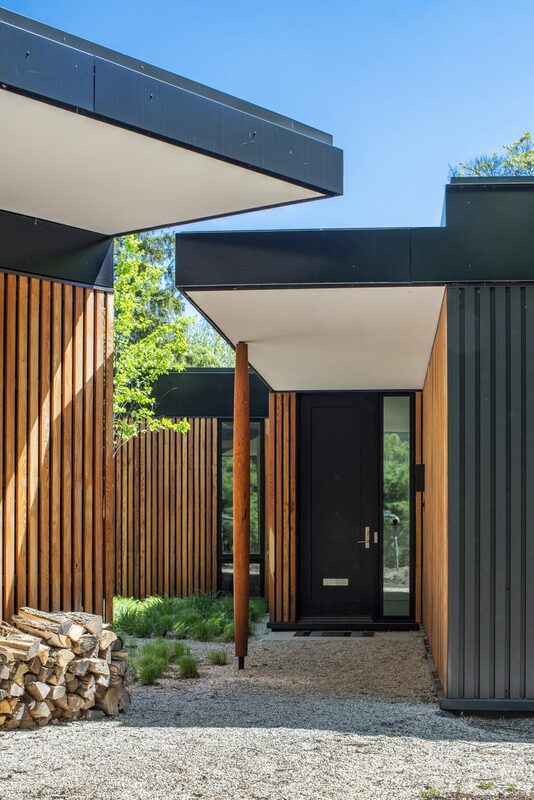 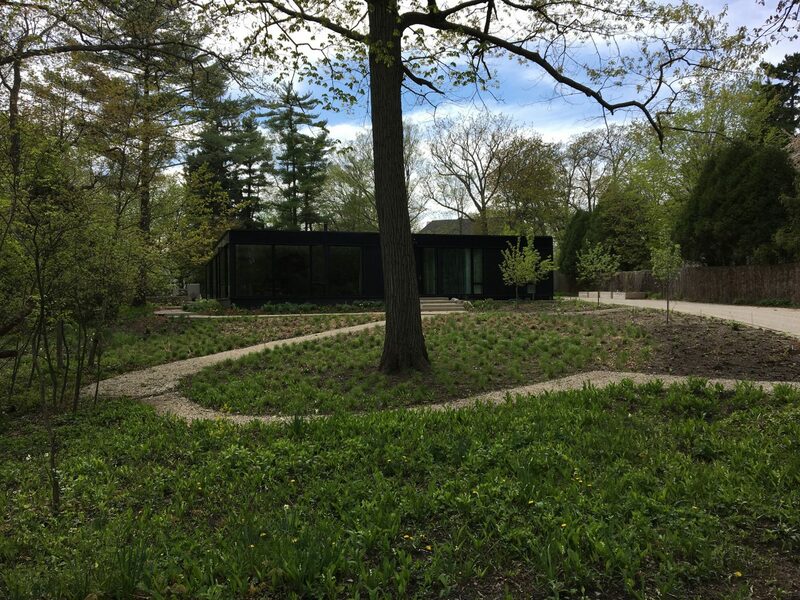 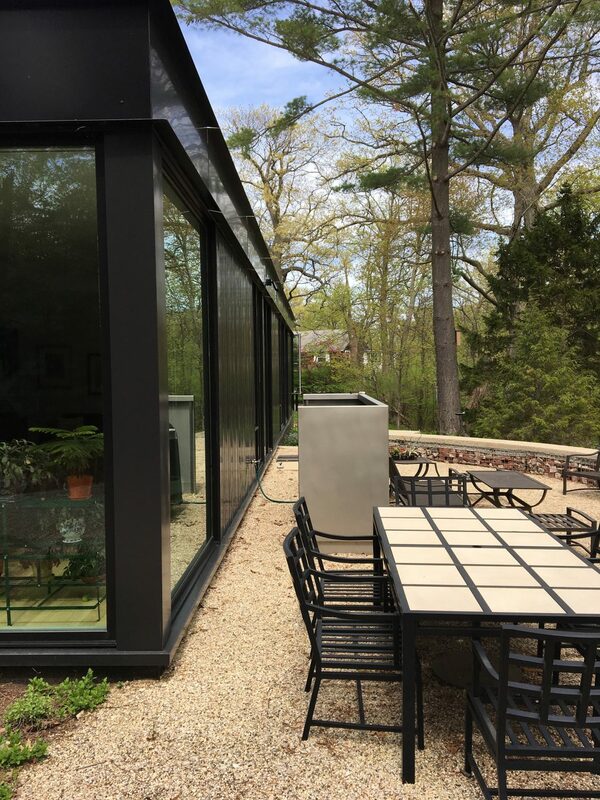 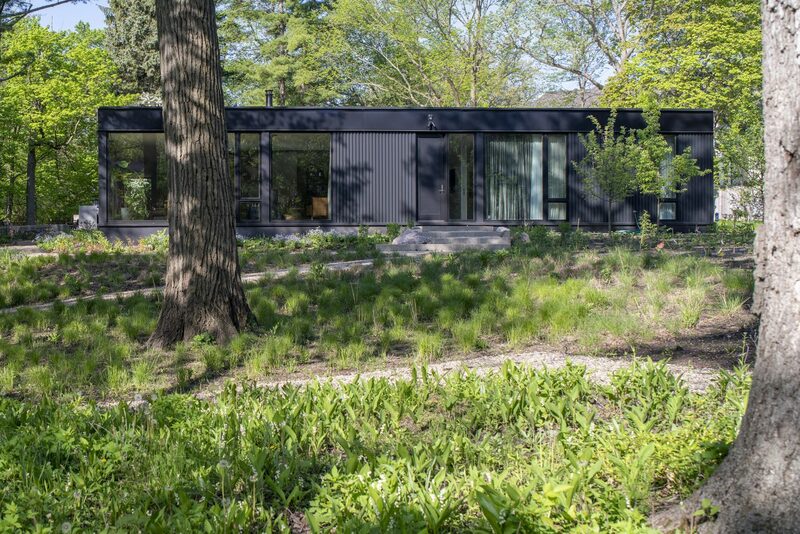 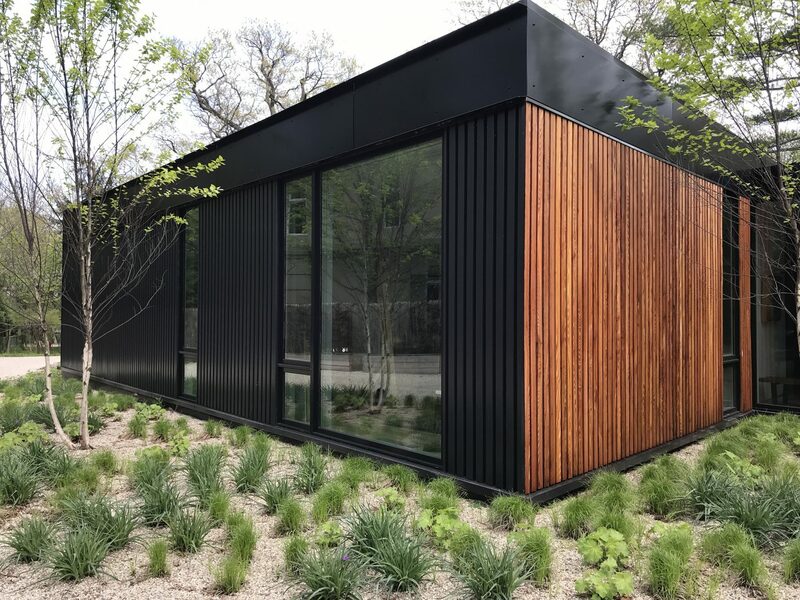 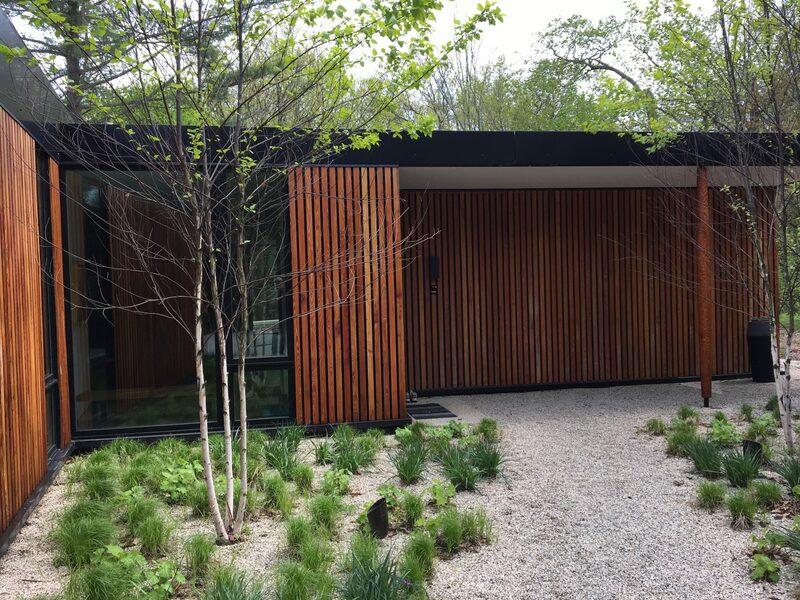 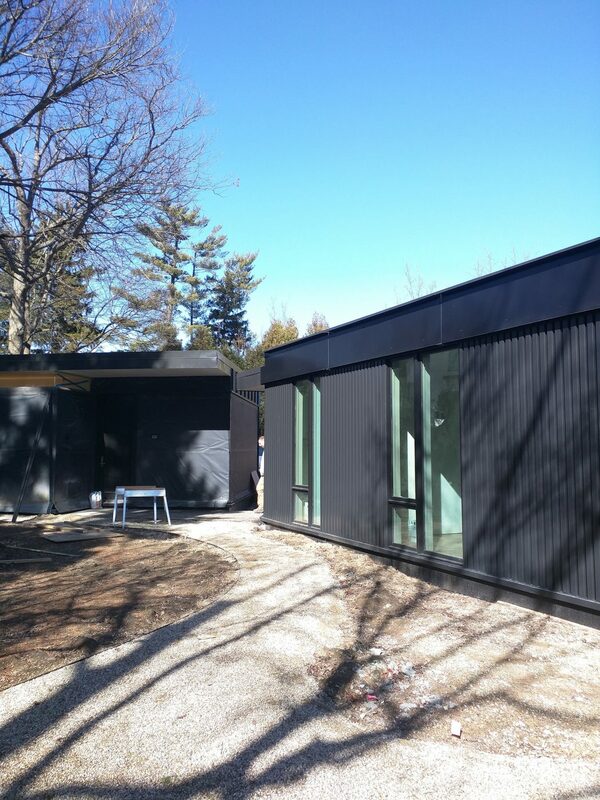 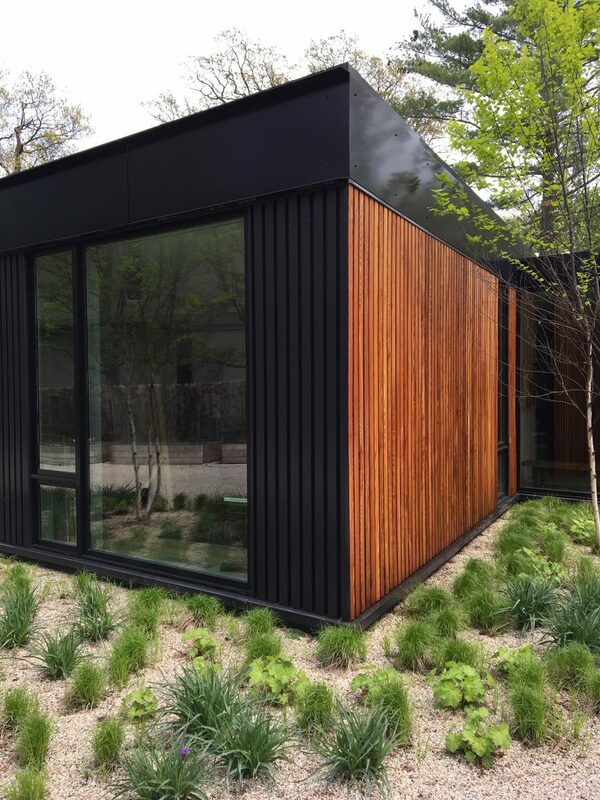 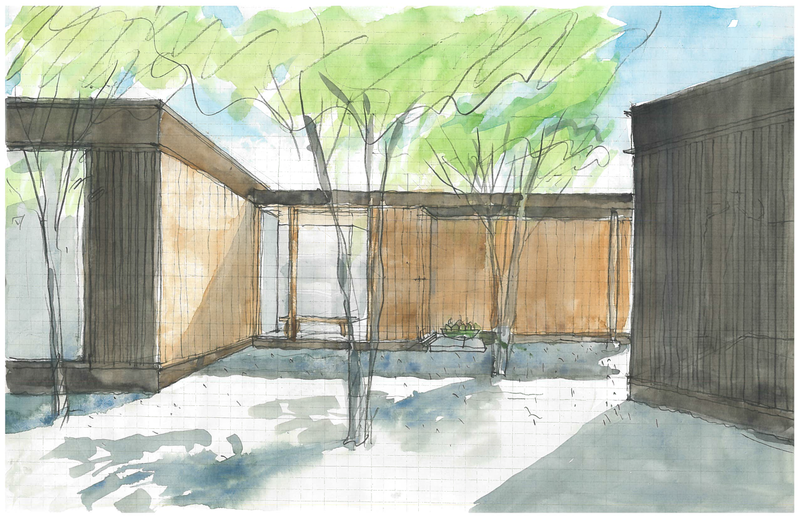 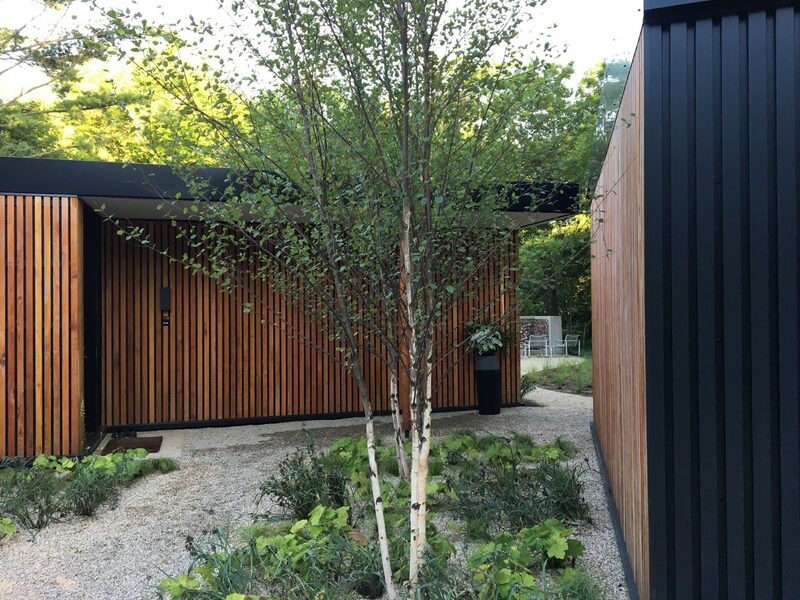 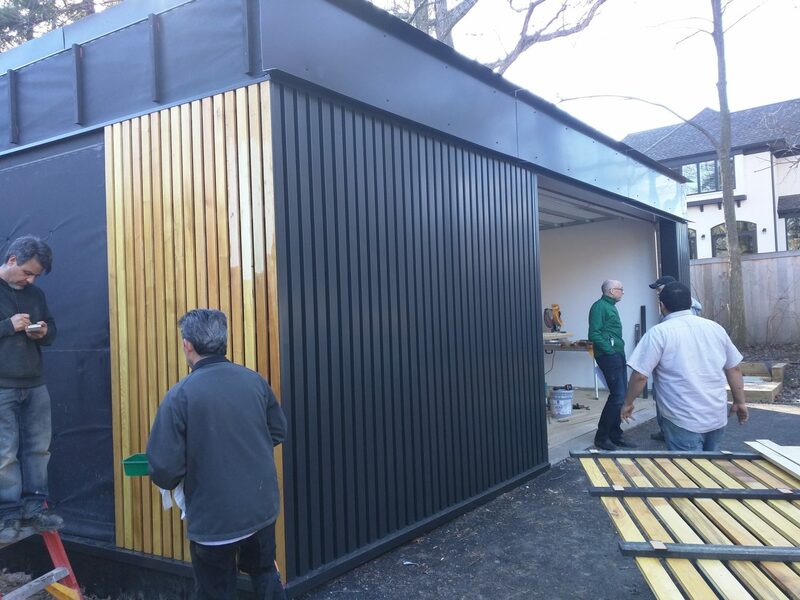 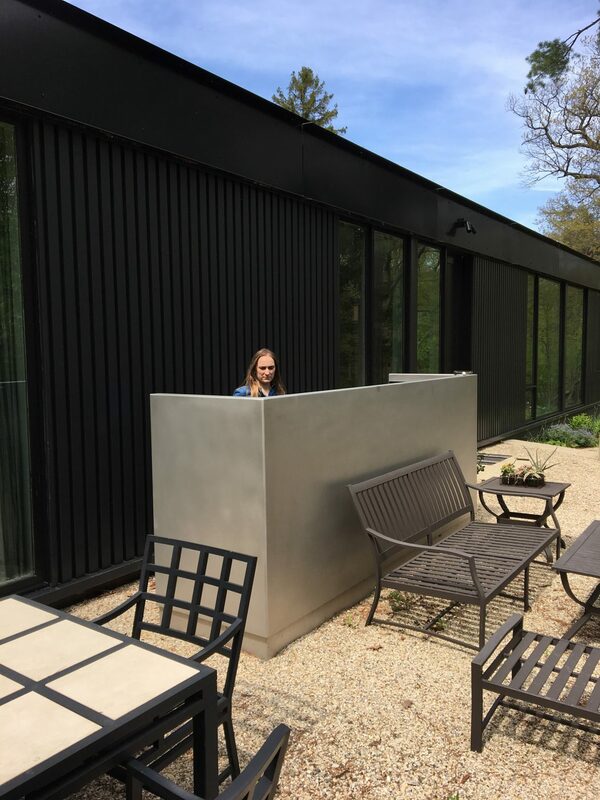 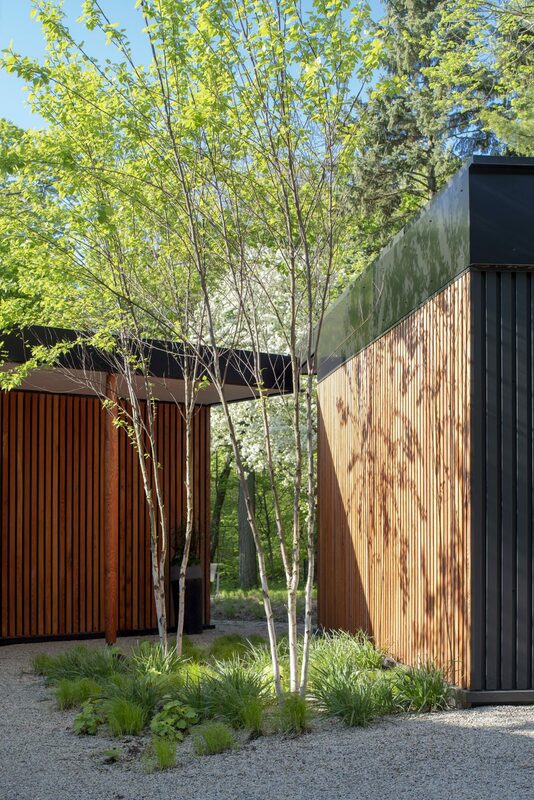 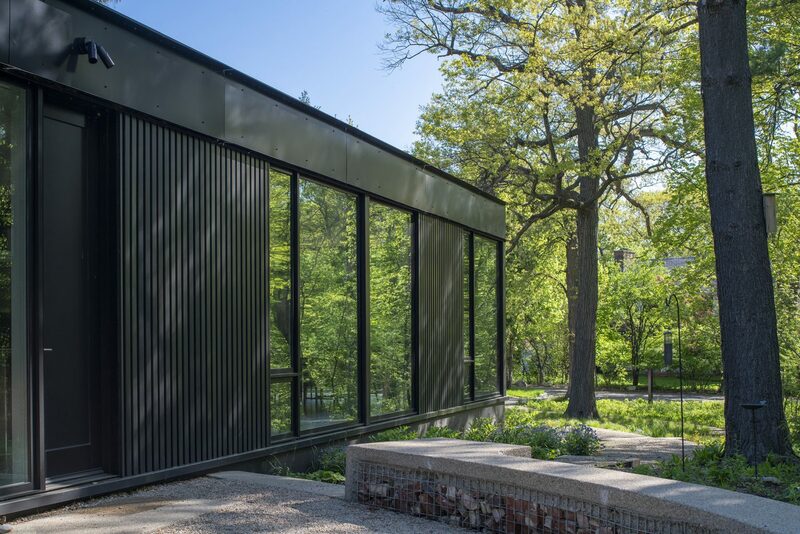 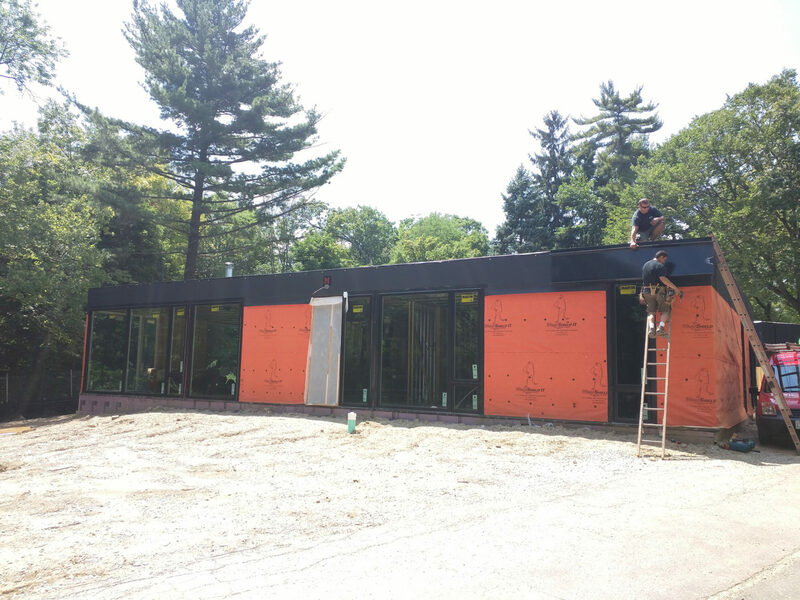 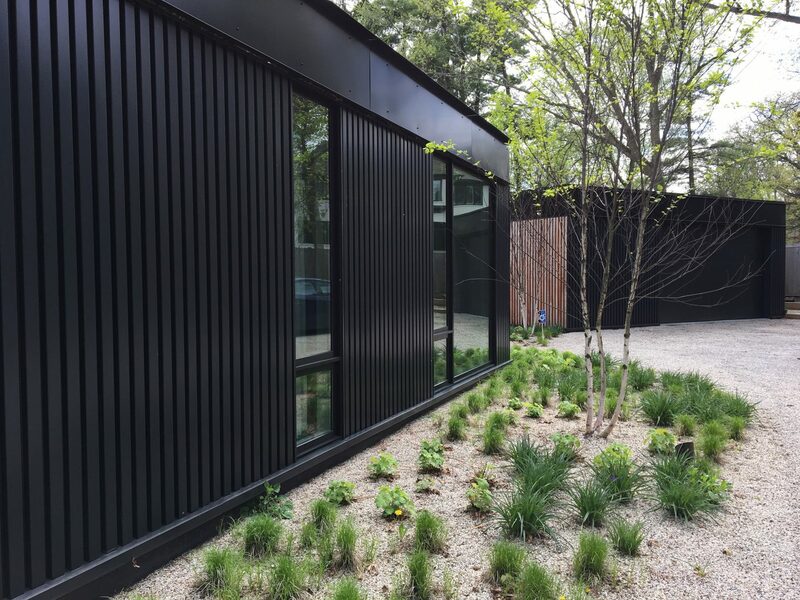 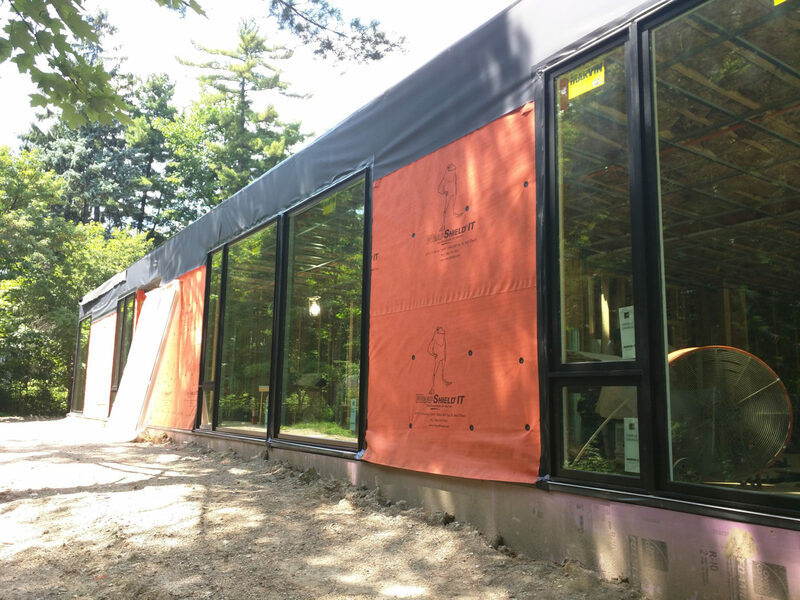 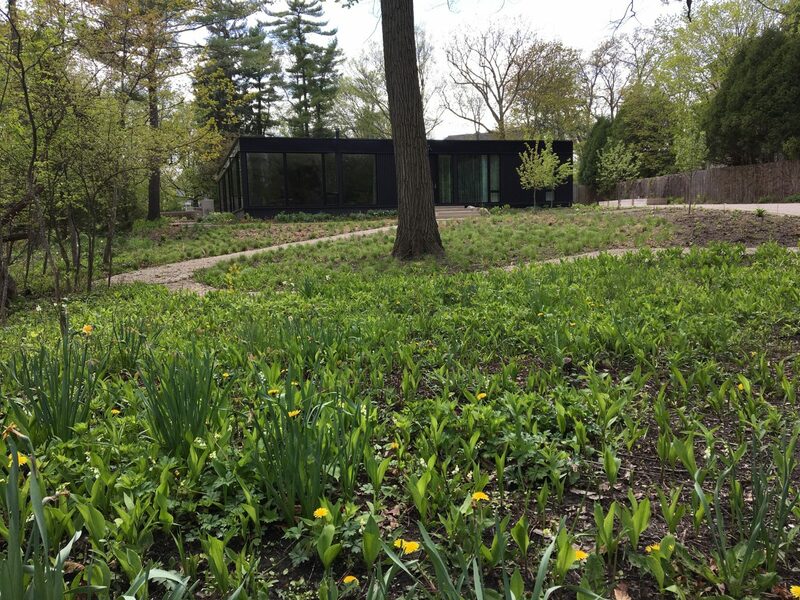 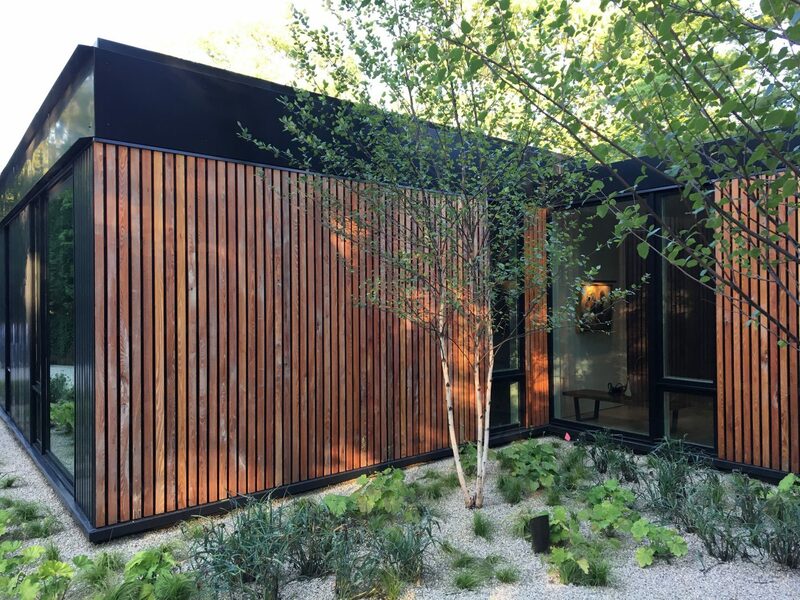 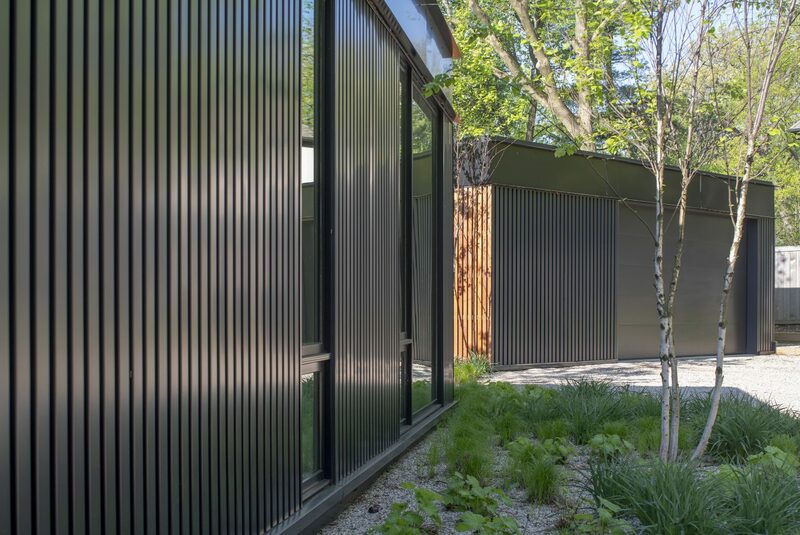 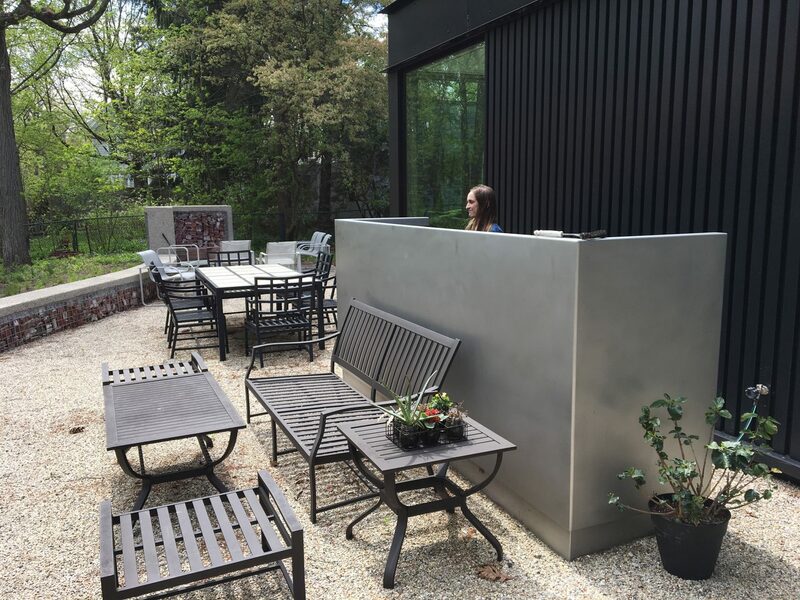 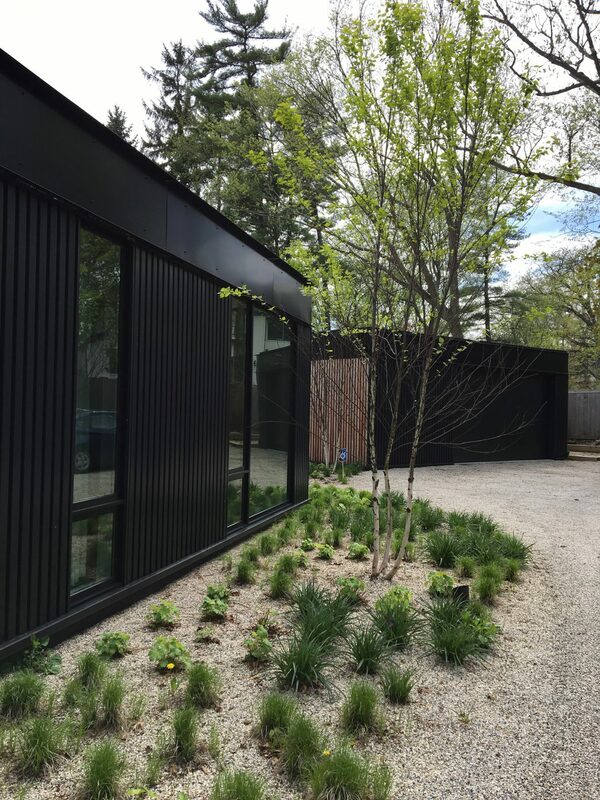 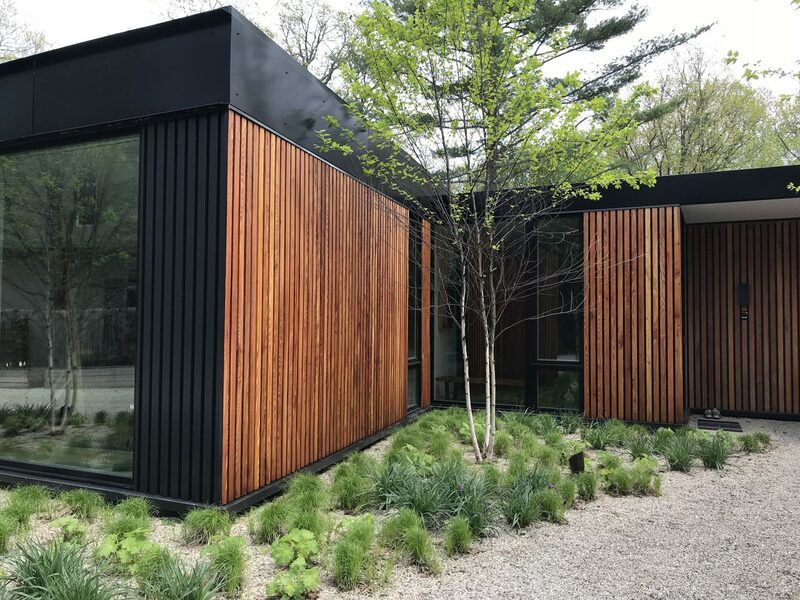 While black square-edged vertical metal siding wraps the primary exterior volume, a vertical rain screen of American Black Locust lines the courtyard. 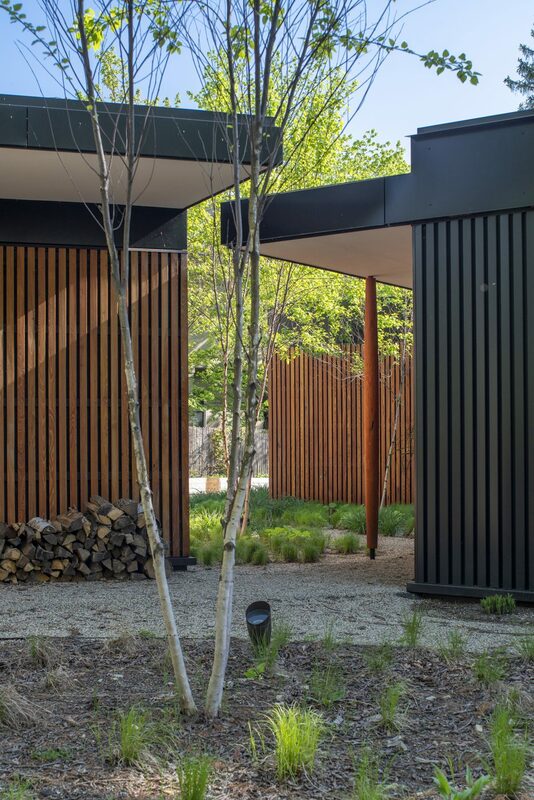 Local stones and birch flow through this courtyard; in essence – the trees win. 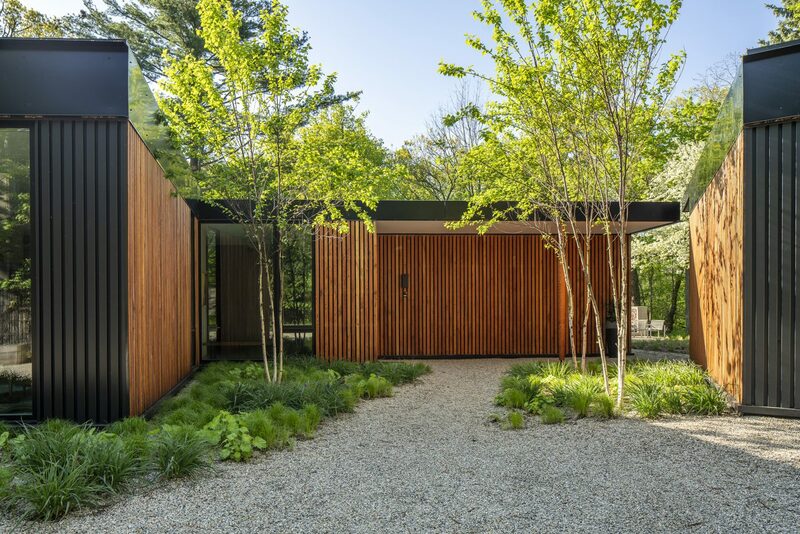 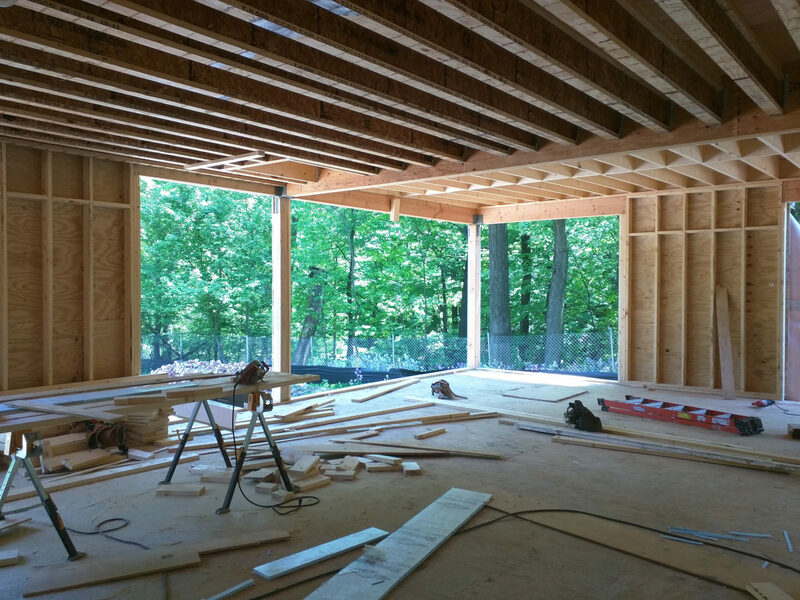 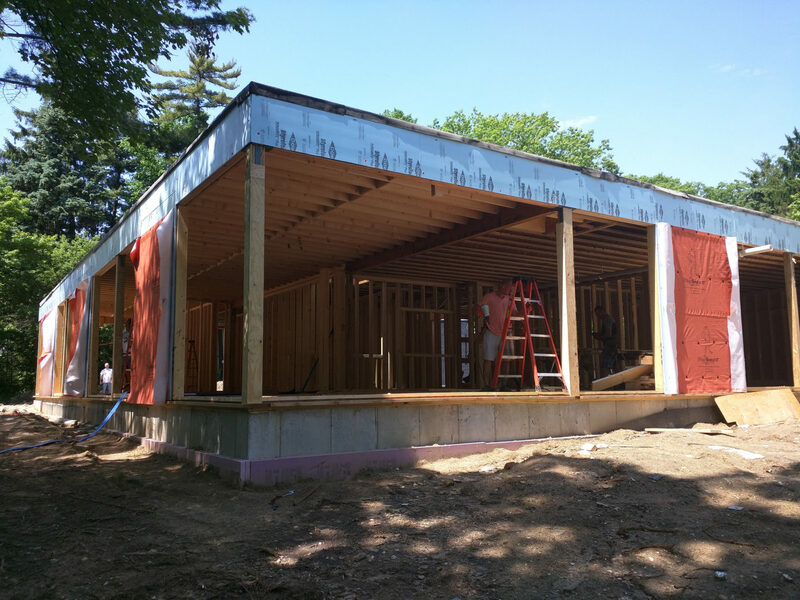 The house and garage are intentionally placed apart to promote interaction with natural forces. 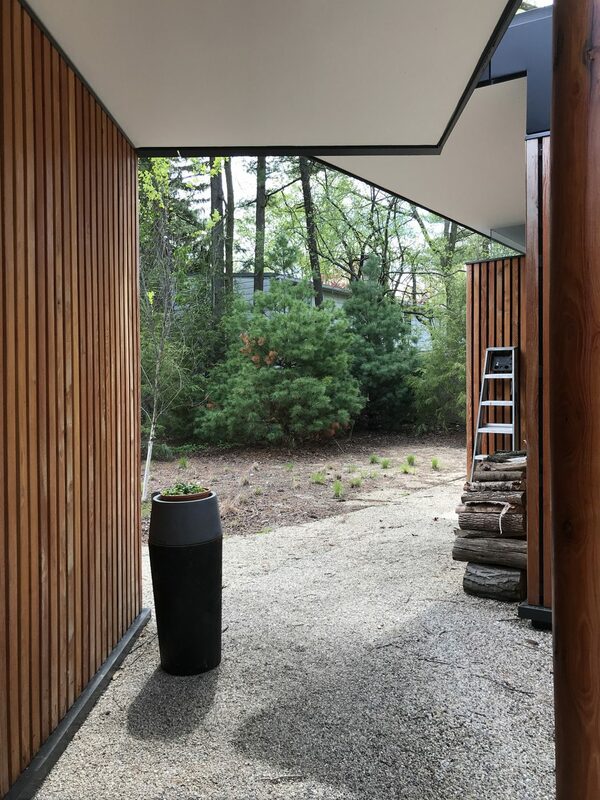 A singular, turned column of Black Locust supports an entry canopy, positioned just so it begs to be touched as one walks past. 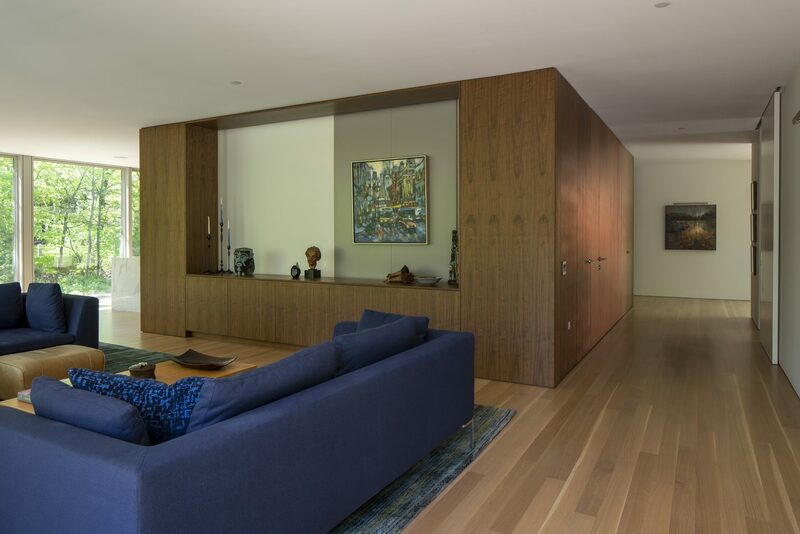 Within, the heart of the home is a central volume of American Walnut. 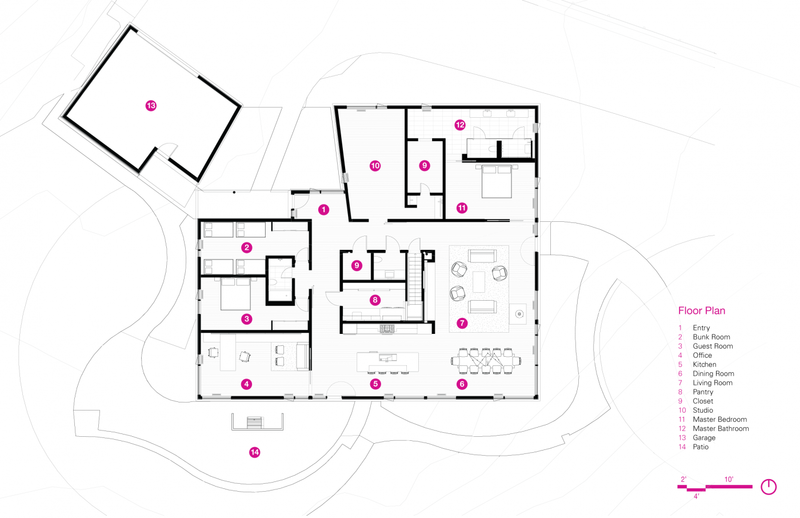 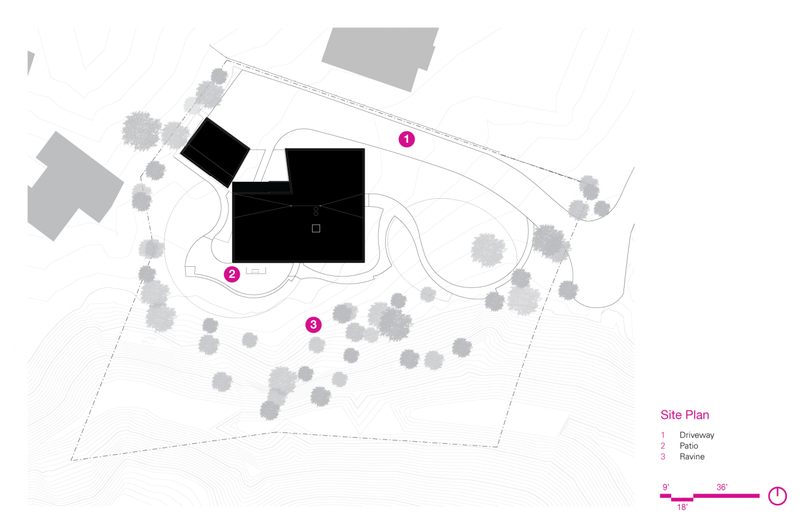 All rooms feed off this hub and are drawn to it, revolving around the warmth of the material. 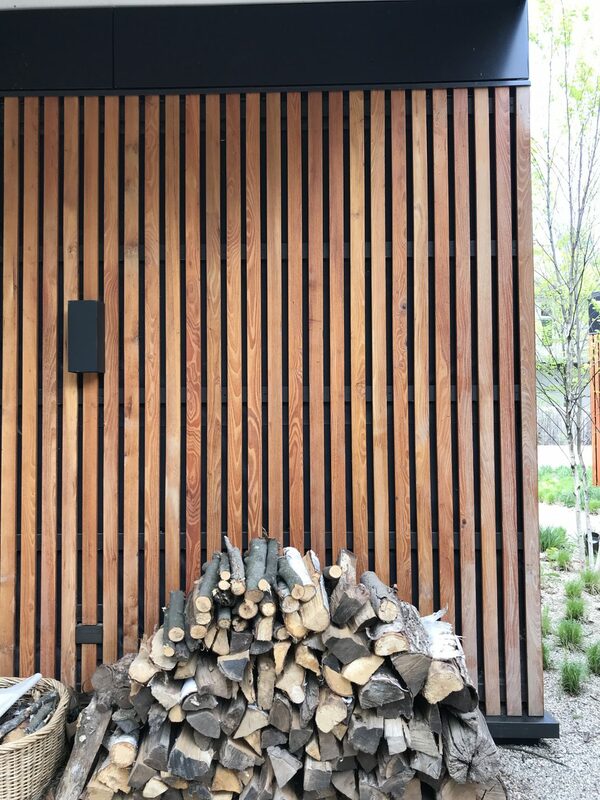 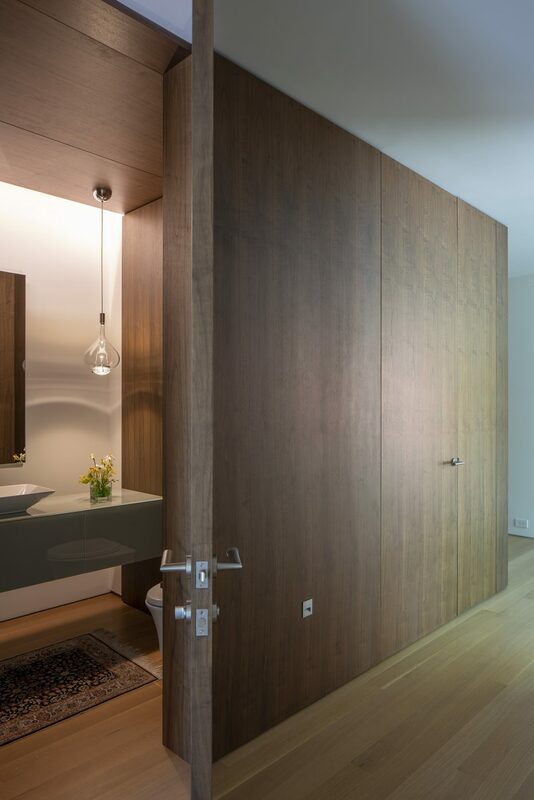 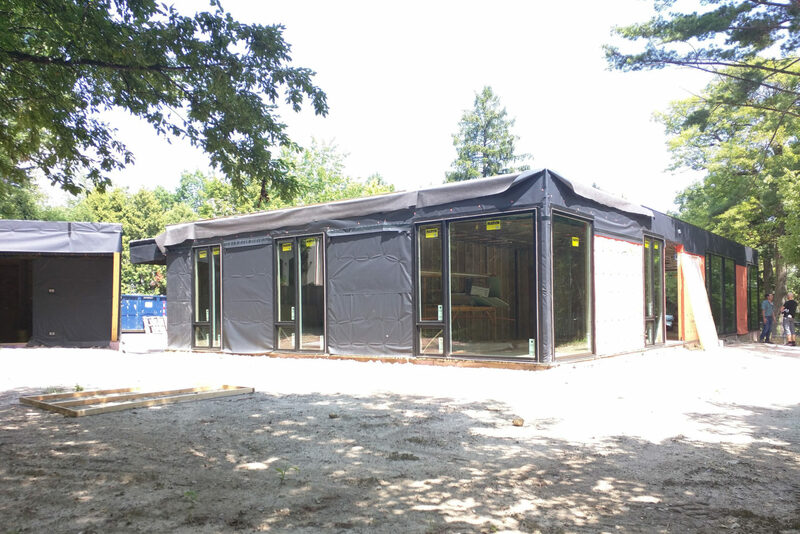 Wood was the obvious choice, preferred for cost and its inherent characteristics of sustainability and warmth. 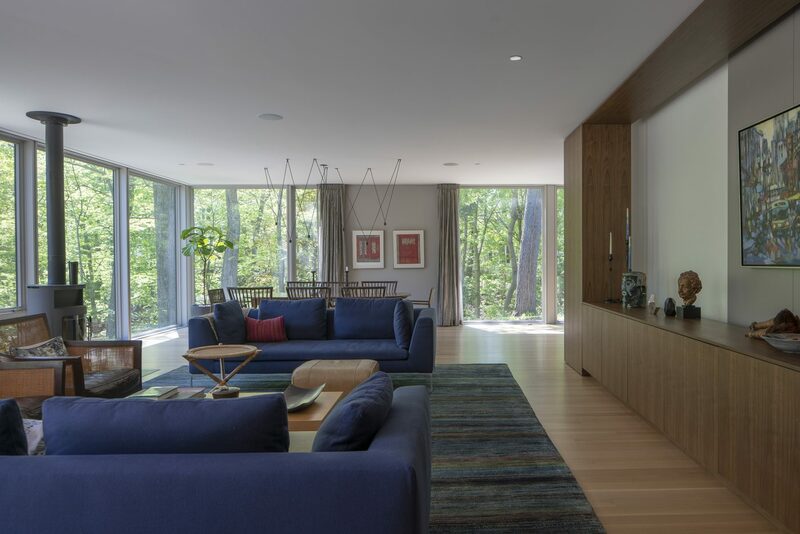 Less commonly-used Black Locust was chosen in lieu of an endangered species of jungle hardwood. 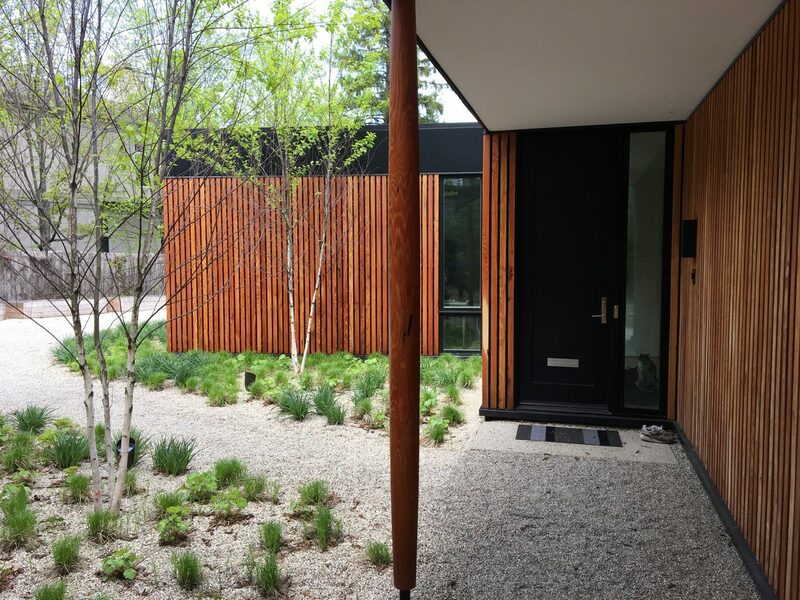 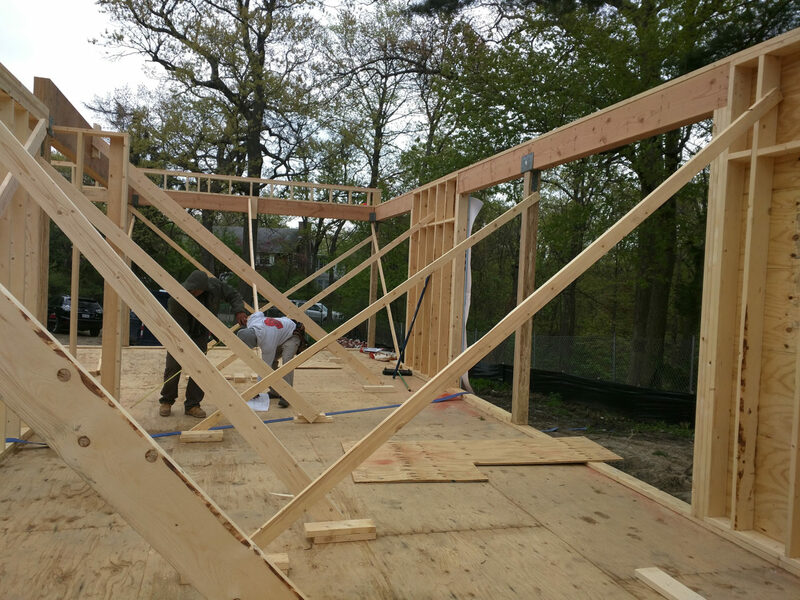 Sourcing the Black Locust of the specified length was a challenge, both for the rain-screen and the turned column. 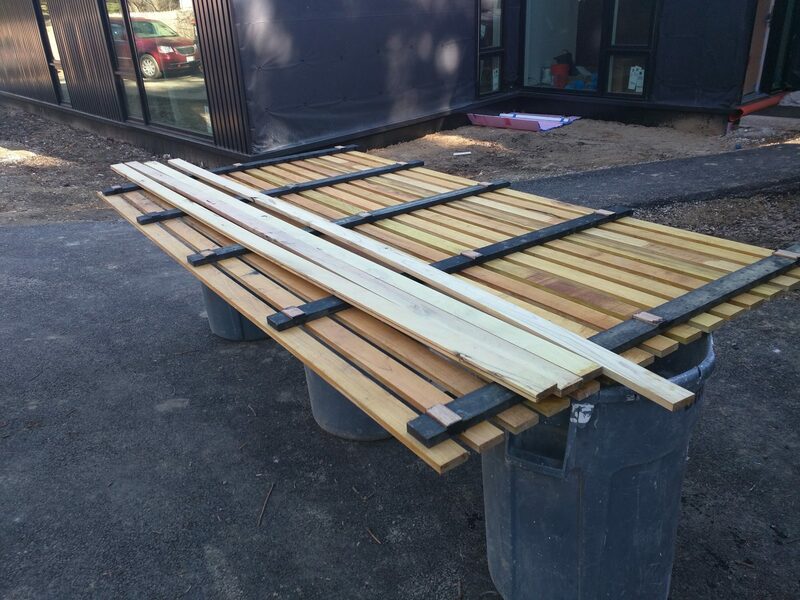 But worth it. 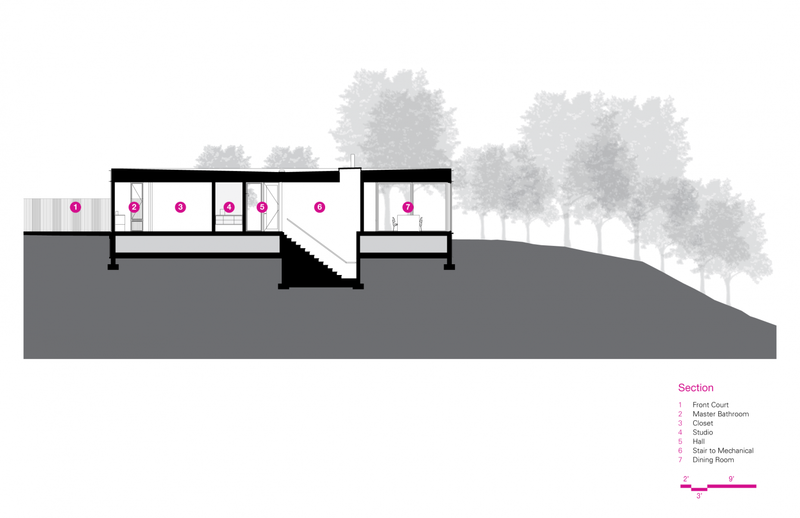 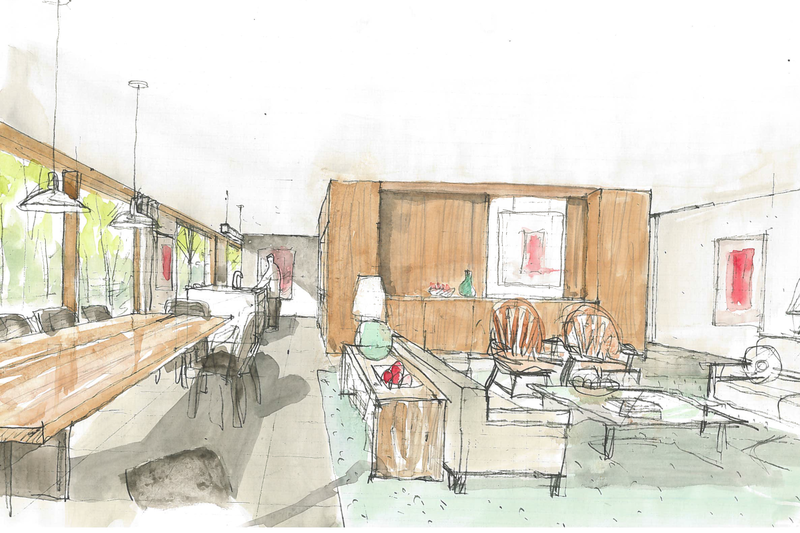 The project is a synthesis of the clients’ past and future. 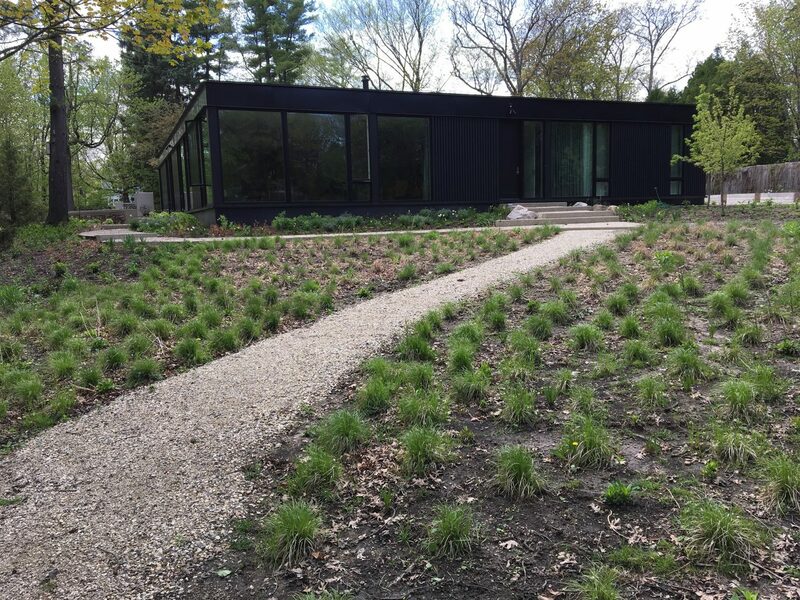 They are continuing to restore the ravine from invasive species, and personally planting no-mow meadows. 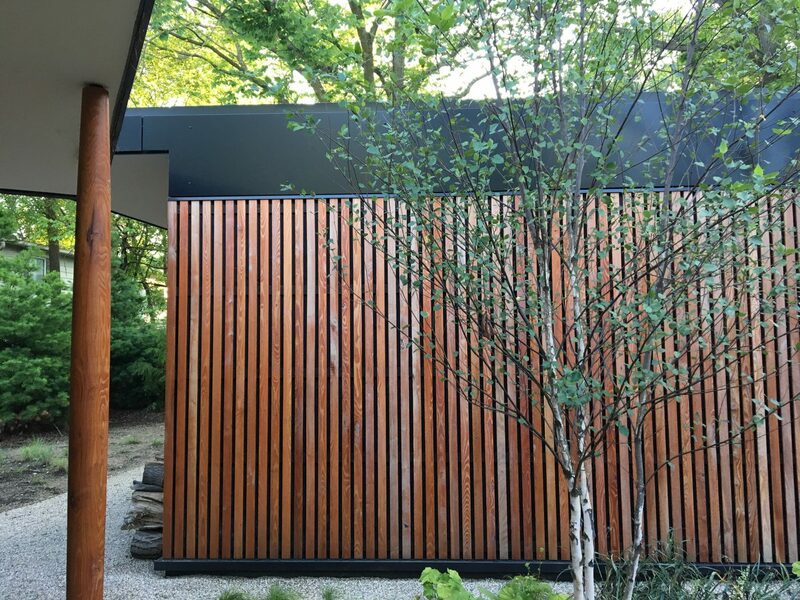 They tap the onsite maples for syrup, boiled down in a fire from cordwood sourced on-site. 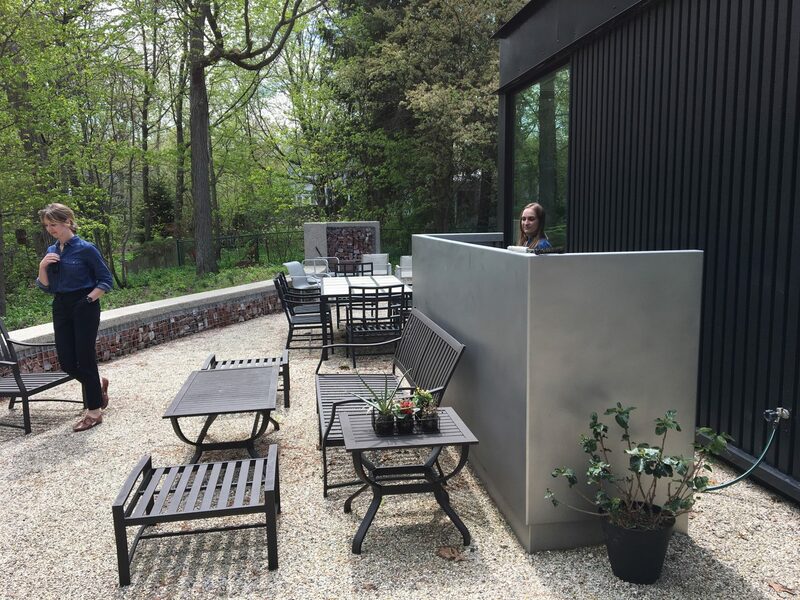 The firepit of brick gabions is created from the rubble of the previous on-site house that had burned down. 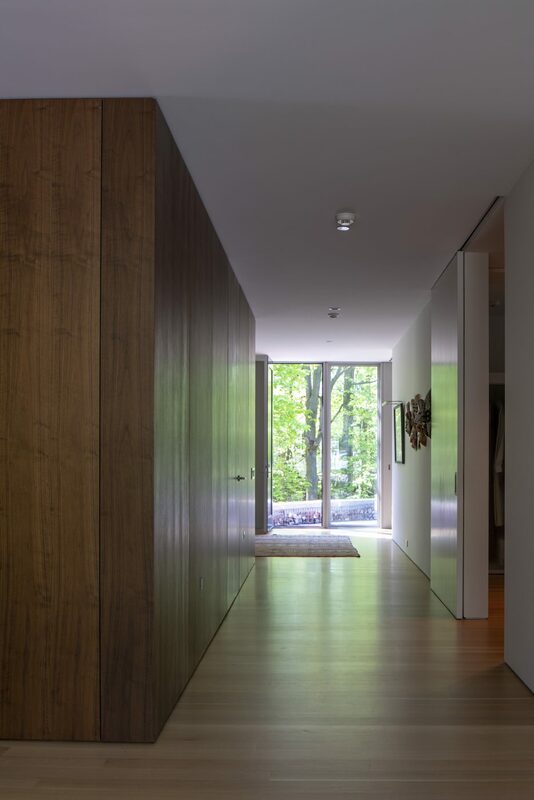 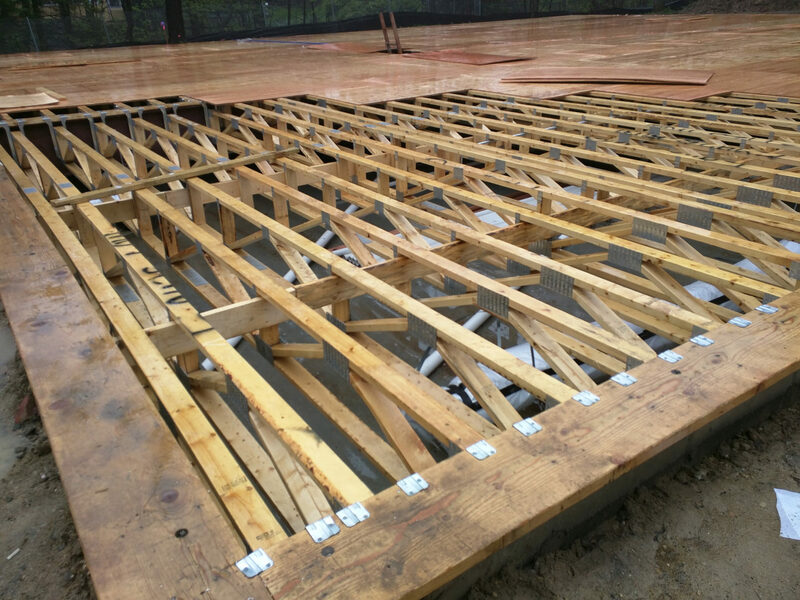 Inside, the clients walk on continuous white oak floors. 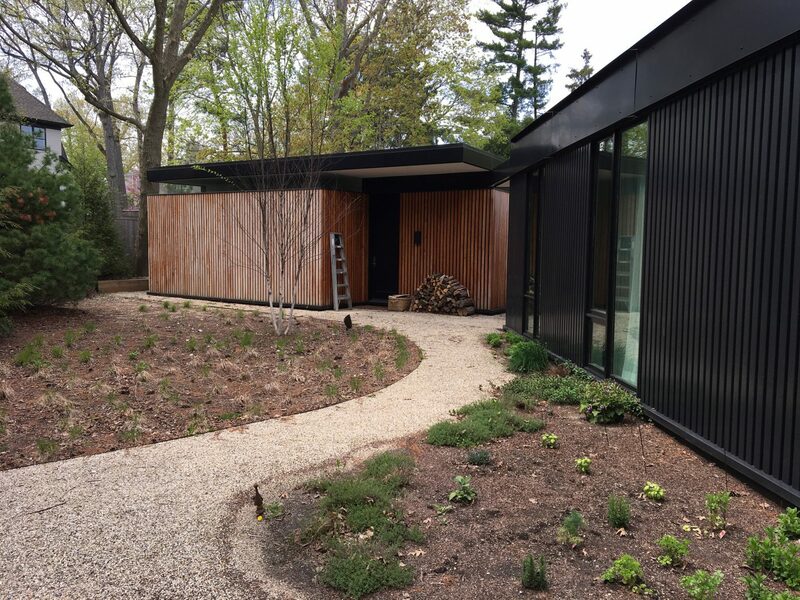 The painting/spinning studio views past the courtyard birches to the raised beds of vegetable gardens that the clients built themselves. 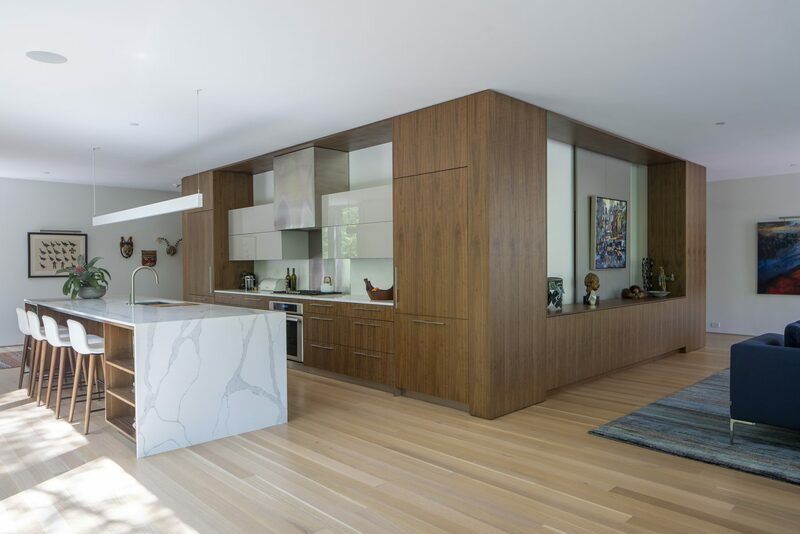 Just in time for Thanksgiving, the millworker who fabricated the walnut casework delivered a live-edge walnut dining table, created from a felled tree the clients had on their farm in Galena, Illinois.